Are you pissed off with wrinkles and fine lines and wondering which cosmetics products to use to get rid of the wrinkles? Well, given a chance, all of us would like to hide the wrinkles and fine line and get naturally healthy and glowing skin. 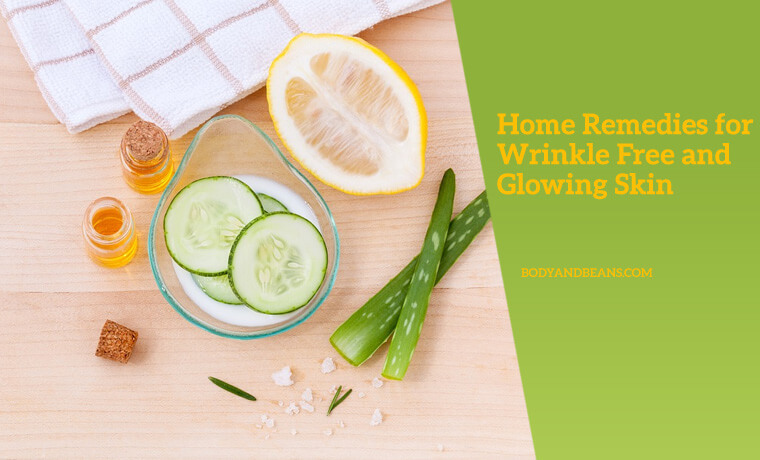 Well if that’s what you want, then instead of relying on the commercial beauty products, you may like to try natural home remedies for wrinkle free and glowing skin. Today in this post, I am sharing the list of 14 tried and tested natural home remedies that’ll help you to wrinkle free and glowing skin naturally. I personally believe that skin is the most essential element that makes a person look beautiful and confident. It is also the part of you that gets noticed in the very beginning. You may have a very beautiful face and very sharp features, but with a dull skin, you may feel the lack of that charm, that all of us strive for. On the other hand, if you got a wrinkle free and glowing skin, then you hardly have to apply too much of makeup on your face to look beautiful. There are many who are naturally blessed with healthy glowing skin for long but same may not be the case for rest of us. Amidst other skin issues, having wrinkles all over your face in the early years of your life is a serious concern. It literally makes you look lifeless and much older than your actual age. Now, who wants to look old at a young age but thanks to the behavioral, environmental and several health issues, we get wrinkles often quite early. Thankfully there are solutions to most of the health and beauty problems with the issue of premature wrinkles being no exception. There are remedies for wrinkle free and glowing skin and I will be discussing the top 14 of such home remedies for wrinkle free and glowing skin today in details. So, if you are pissed off with wrinkles and wondering about how to get naturally healthy and glowing skin, then this is the post which is a must read for you. Wrinkles may look cute on a pug but when it is on your face, I know it actually is a kind of nightmare. Many take the help of expensive cosmetics, surgeries or tons of makeup to hide or get rid of wrinkles. But, if you think practically, then these are not the best solutions to the wrinkles problem. Firstly, there is huge expenditure, and then there is no guarantee of success, even after continuous use. You need to cure the problem from the very roots and hence, I always recommend going the natural way. There are enough remedies for wrinkle free and glowing skin that any of us can use to deal with wrinkles. I would be shortly discussing about how to get wrinkle free and glowing skin in details, but before that, let me brief you about the causes that leads to wrinkles. Age, obviously we have no control over this. There are several factors behind the occurrence of wrinkles but above-mentioned factors are the most common ones. So now, that you know the factors that may lead to wrinkles, I hope you will be able to protect your skin from developing wrinkles early on. Having a beautiful flawless and glowing skin is a dream for many, but sadly due to a number of skin issues, most of our dreams often get shattered. And, talking about skin problems, one of the most common skin concerns is the premature wrinkles all over the face. But, thankfully there are natural home remedies to deal with wrinkles, and today we will learn about the top 14 of such remedies. I have already mentioned that people with extremely dry skin are more prone to having wrinkles. So for them, using coconut oil for wrinkle free skin is a good choice. There are various benefits of coconut oil, one of which is definitely to gift you with a wrinkle free skin. Coconut oil is the perfect moisturizing and hydrating agent that your dry skin requires. Besides removing the fine lines, it will impart a natural glow to your skin and help it to remain soft and supple. Coconut oil is also great in helping you restore the elasticity of the skin and hence it works magically on wrinkles. 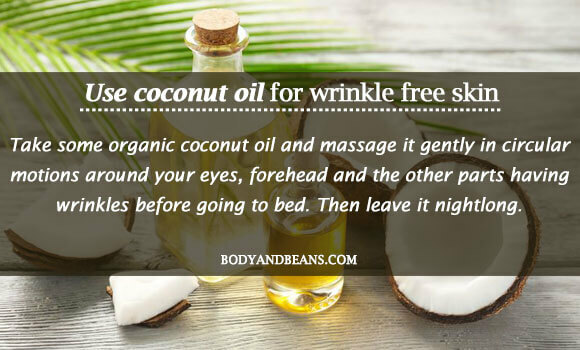 You need to take some organic coconut oil and massage it gently in circular motions around your eyes, forehead and the other parts having wrinkles before going to bed. Then leave it nightlong. If you repeat it every night, then you will experience the improvements really fast. 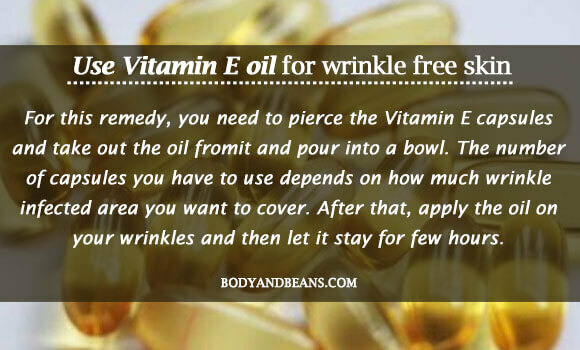 The other option which is good to be used on your dry skin to get rid of the wrinkles is Vitamin E oil. It is a great moisturizer which has various antioxidants and skin hydrating properties than freshens up your skin. Studies also prove it as anti-inflammatory which imparts photoprotective effects on your skin. This actually helps your skin in renewing the lost vigor and results in lessening of the wrinkles. For this remedy, you need Vitamin E capsules. You need to pierce the capsules and take out the oil fromit and pour into a bowl. The number of capsules you have to use depends on how much wrinkle infected area you want to cover. After that, apply the oil on your wrinkles and then let it stay for few hours. Best time is to apply it every night before you go to sleep. Grapes are great for your skin and they can help you deal with the problem of wrinkles. The grape seed extracts or grape seed essential oils lead to tightening of your skin, and it leaves a healthy glow on your face. 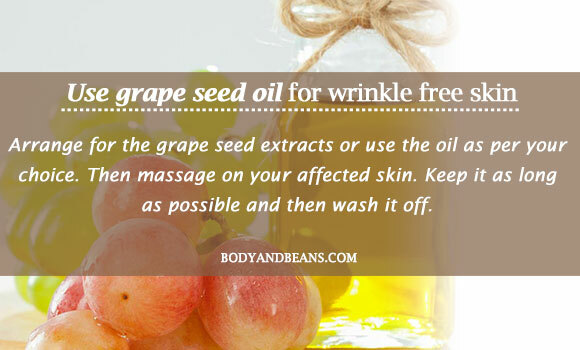 On applying grape seed oil, your skin will become soft and supple, thanks to the presence of healthy fatty acids, Vitamin E and polyphenols in them that are extremely beneficial to get wrinkle free and glowing skin. Arrange for the grape seed extracts or use the oil as per your choice. Then massage on your affected skin. Keep it as long as possible and then wash it off. Use the remedy frequently for a few weeks and enjoy the wrinkle free and glowing skin. 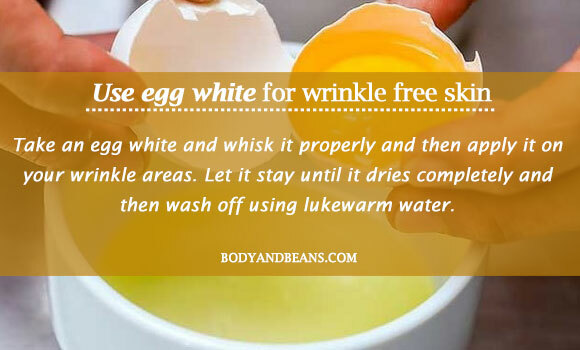 Using egg whites is one of the most effective remedies for wrinkle free and glowing skin. It naturally tightens your skin and helps you get rid of the fine lines and the wrinkles. This is particularly useful for people who have oily skin as egg white also benefits in unclogging the pores and absorbing the excess amount of oil and sebum from your skin. Take an egg white and whisk it properly and then apply it on your wrinkle areas. Let it stay until it dries completely and then wash off using lukewarm water. This is a great remedy and you can use it once or twice weekly for best results. 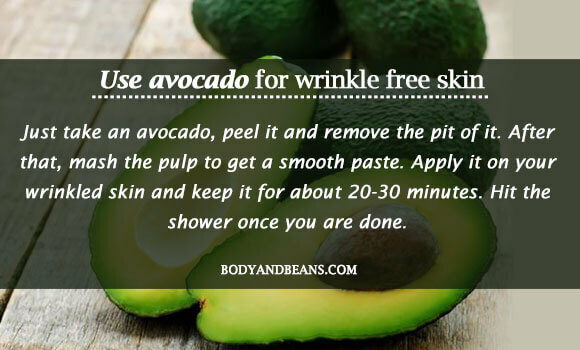 Well, apart from the several health benefits, avocado can help you get a gorgeous skin by removing your wrinkles. It pampers your skin a lot and with all the rich nutrients in it, it makes your damaged skin healthy and lively. It will make your skin flawless and radiant just the way you desire it to be. Just take an avocado, peel it and remove the pit of it. After that, mash the pulp to get a smooth paste. 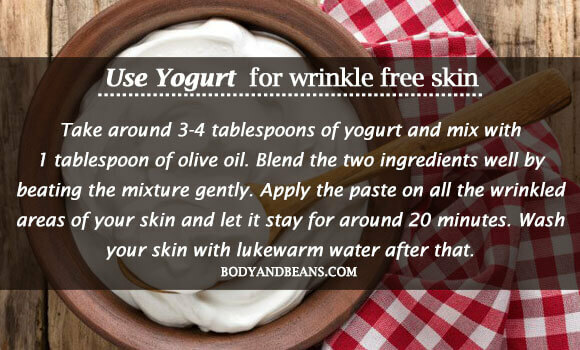 Apply it on your wrinkled skin and keep it for about 20-30 minutes. Hit the shower once you are done. If you use the avocado weekly 1-2 times, then I am sure you will be rewarded with a wonderful skin. Cucumber is extremely skin friendly and it has been used in treating many skin problems, one of them being the problem of wrinkles. 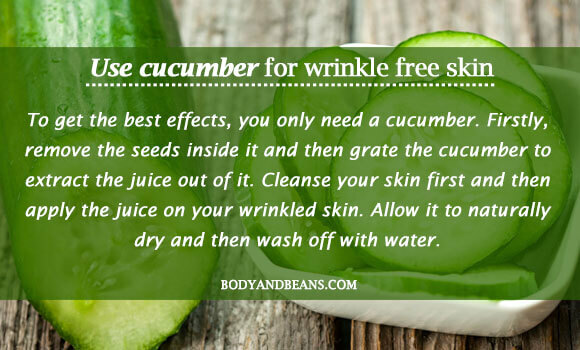 Now, dehydrated skin is mostly prone to wrinkles and hence cucumber, with 95% of water content in it is the best solution for wrinkles. Moreover, there are other vitamins and minerals in it that will keep your skin healthy and glowing with all the fine lines, dark circles etc. gone forever. To get the best effects, you only need a cucumber. Firstly, remove the seeds inside it and then grate the cucumber to extract the juice out of it. Cleanse your skin first and then apply the juice on your wrinkled skin. Allow it to naturally dry and then wash off with water. You can do this almost every day to get rid of the wrinkles and the other dark spots fast. Studies have already shown the potentiality of honey in skin care and hence it has been a part of dermatology for a long time. Now, you can use honey to free your skin off the wrinkles. It will help you in balancing the pH level of your skin and will condition it accordingly to help your skin be free off the wrinkles and the fine lines. 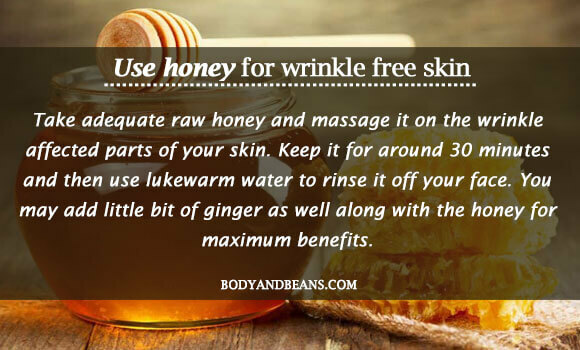 Take adequate raw honey and massage it on the wrinkle affected parts of your skin. Keep it for around 30 minutes and then use lukewarm water to rinse it off your face. You may add little bit of ginger as well along with the honey for maximum benefits. 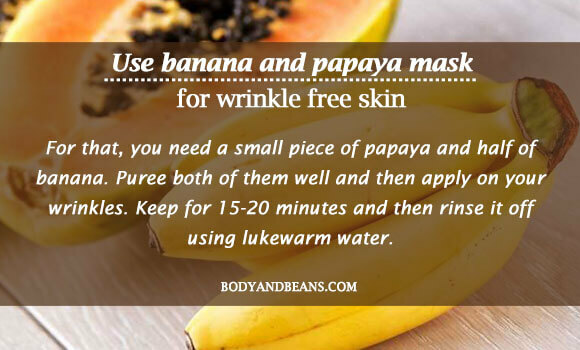 This is one of the greatest remedies for wrinkle free and glowing skin and you can do it daily to get fast results. Needless to say, aloe vera is one of the most popular ingredients as far as treating skin problems goes. Aloe vera is used in various cosmetic products and remedies to cure different types of skin and hair related issues. It is indeed a great option for you to try in order to get rid of the wrinkles on your face. With all the nutrients in it especially Vitamin E, it is definitely a booster for your skin. It also contains several healthy antioxidants that are good for your skin and its antimicrobial and anti-inflammatory properties will help you deal with the other skin issues like swelling, acne etc. very well. In addition, aloe vera can also protect your skin from the damages caused due to UV exposure and leave your skin flawless and free of fine lines and wrinkles just the way you want it to be. Aloe vera gel alone is extremely good to treat your wrinkles but you can also add egg white along with it for the most desirable results. 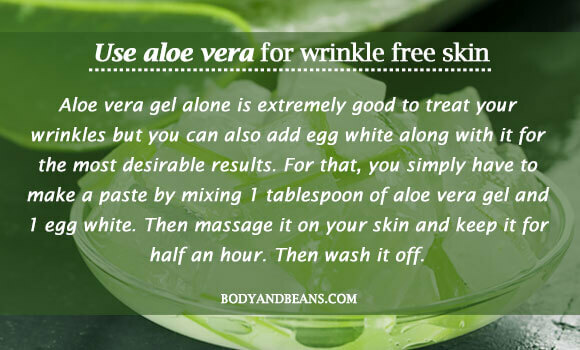 For that, you simply have to make a paste by mixing 1 tablespoon of aloe vera gel and 1 egg white. Then massage it on your skin and keep it for half an hour. Then wash it off. Use this remedy at least two times on a weekly basis for excellent skin improvements. Lemon juice can help you treat your wrinkles just the way it has benefitted in several other skin treatments. The main reason why it is so effective against your wrinkles is the presence of Vitamin C in it which helps to rebuild the collagen in your skin which in turn helps to fade away the fine lines and the wrinkles away. 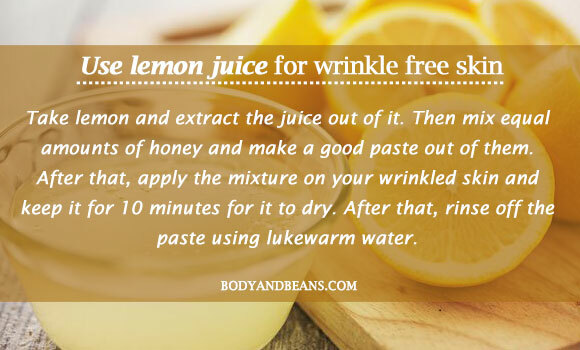 Lemon juice is actually great for getting a wrinkle free skin but since it can make your skin dry, it is best if you can use the other healthy skin friendly ingredient honey along with it for better results. Take lemon and extract the juice out of it. Then mix equal amounts of honey and make a good paste out of them. After that, apply the mixture on your wrinkled skin and keep it for 10 minutes for it to dry. After that, rinse off the paste using lukewarm water. Repeat the remedy two times in a week for effective benefits. 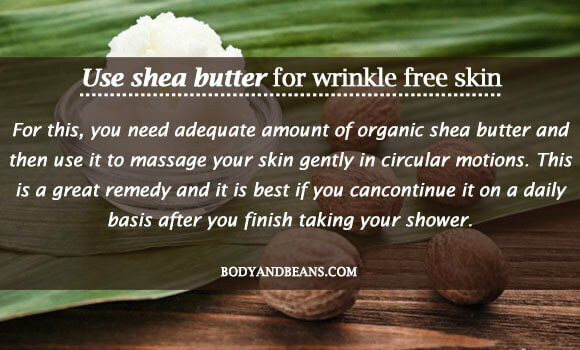 One of the other remedies for wrinkle free and glowing skin which is worth trying is by applying shea butter on your skin. This particular ingredient is extremely skin hydrating and also helps in improving the elasticity of your skin. It also promotes the synthesis of the collagen which further helps in getting rid of the wrinkles and the fine lines. For this, you need adequate amount of organic shea butter and then use it to massage your skin gently in circular motions. This is a great remedy and it is best if you cancontinue it on a daily basis after you finish taking your shower. 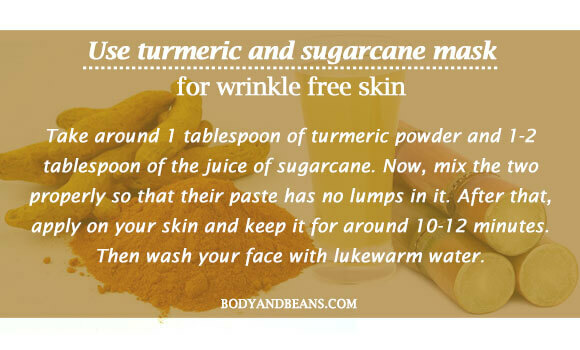 Well, the turmeric and sugarcane mask is great for your skin and it is one of the most efficient remedies for wrinkle free and glowing skin. Both the ingredients together help in slowing down the loosening of your skin which results in less or no wrinkles and fine lines on your skin. And, as far as their individual skin benefits goes, sugarcane is great in removing the dead skin cells thanks to the presence of glycolic acid in it while on the other hand; turmeric is a natural healer which makes your skin rejuvenated. If you use the turmeric and sugarcane mask, I am sure you are going to be gifted with a radiant and flawless skin soon. Take around 1 tablespoon of turmeric powder and 1-2 tablespoon of the juice of sugarcane. Now, mix the two properly so that their paste has no lumps in it. After that, apply on your skin and keep it for around 10-12 minutes. Then wash your face with lukewarm water. For maximum benefits, use this remedy two times on a weekly basis. However, remember to use the turmeric powder that is used for tropical application as it stains less. Avoid the one used while cooking as that will leave your skin too yellowish which you may find difficult to remove. Yogurt has lactic acid and other natural enzymes present in it which helps to cleanse the pores and eventually making them shrink. This phenomenon enables your skin to tighten which in turn results in the reduction of the wrinkles and the fine lines from your skin. Yogurt also helps in getting rid of the other scar marks and leaves your skin smooth and supple. Mixing a little of olive oil into yogurt will increase the good effects and so I suggest that. Take around 3-4 tablespoons of yogurt and mix with 1 tablespoon of olive oil. Blend the two ingredients well by beating the mixture gently. Apply the paste on all the wrinkled areas of your skin and let it stay for around 20 minutes. Wash your skin with lukewarm water after that. This remedy is good and is best if used two times weekly. This is a great mask for getting rid of your wrinkles and fine lines completely. As individual ingredients, both of them are great for your skin. Papaya is rich in enzymes, one of the most efficient ones being papain that is beneficial for your skin while on the other hand, the banana is loaded with vitamins which leaves your skin revitalized. Together, they are great in fighting the premature aging signs of wrinkles and fine lines. For that, you need a small piece of papaya and half of banana. Puree both of them well and then apply on your wrinkles. Keep for 15-20 minutes and then rinse it off using lukewarm water. Using it one or two times weekly will be highly rewarding. If you have got wrinkles on your skin due to the exposure to harmful ultraviolet rays of the sun then the tomato mask is probably the right solution for you. This is because the beta-carotene and the lycopene present in tomatoes help to reverse the damage caused by the harsh UV rays. Using the tomato along with little sea salt diligently will help you in getting rid of all the fine lines, wrinkles, freckles and other age spots permanently. Take a small ripe banana and 2 tablespoons of sea salt. Cut the tomato in two halves and then dip the inner half into the sea salt. 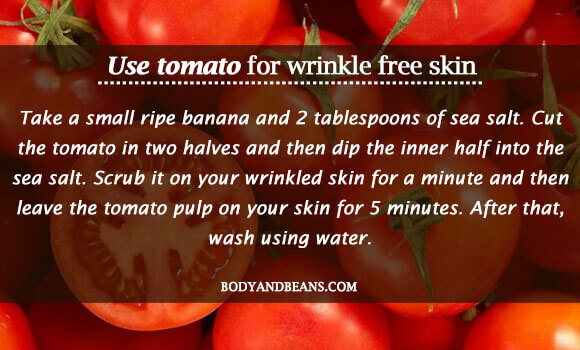 Scrub it on your wrinkled skin for a minute and then leave the tomato pulp on your skin for 5 minutes. After that, wash using water. Use this remedy two times weekly for good results. In the meantime, also include tomato paste in your diet for faster results. Over to you: Which is your fav remedy for wrinkle free and glowing skin? Skin contributes a lot to the external beauty and having a natural good skin is a blessing. However, even though you are born with a good skin, you tend to get affected by fine lines and wrinkles at some time or the other. While with age, it becomes quite natural, the main problem occurs if you get affected by premature aging signs early on. After all, who wants to look aged when still young? But, thanks to the several natural ingredients that Nature has gifted us. We can always get rid of these premature aging spots with natural ingredients. You just have to use the right ingredients in the right way and reap the maximum benefits of it. Here, I have talked about 14 of the most effective remedies for wrinkle free and glowing skin. Most of them have already been used in several skin treatments earlier with satisfactory results and now it is time to use them to get rid of the wrinkles. I am sure that if anyone uses these remedies correctly, they will be able to get rid of wrinkles and other skin issues naturally and easily. Apart from talking about best natural home remedies for wrinkle free skin, I have also talked about the common causes that may lead to premature wrinkles. I talked about it to make you aware that many of the unhealthy habits that you may be practicing may actually cause wrinkles on your skin. So, if you are into excessive smoking, excessive alcohol consumption, eating too much sugar and others, please give up these bad habits and adopt healthy living habits for your own good. Jot down the other causes as well so that you may avoid them as far as possible. Worried about wrinkles on your skin? Well, shed off your worries as there are natural remedies for wrinkle free and glowing skin. 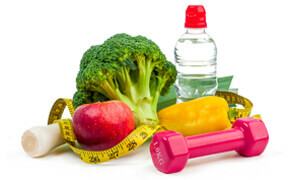 These methods are extremely cost effective and will surely be of great help to you in fighting with wrinkles. Pick your favorite remedy and tell us how it has worked for you. Your suggestions are valuable to us so you may share some good advice with us as well. Until then, stay beautiful and do not let the wrinkles ruin your joy. Love this article! I really like this article so much and can’t wait to try these remedies. Thanks a lot for the great article.